New Haven 529 is an RS-3 1600 HP Diesel road switcher, built by Alco, August 1950 (#78176). The first former New Haven locomotive ever to be preserved, the 529 (class DERS-2c) was a member of a large fleet of RS-3s purchased by the New Haven to retire their final steam power. 529 was rebuilt and upgraded to its current configuration by Alco in 1959. The RS-3s were used over most of the system in all services until the railroad’s demise on December 31, 1968 when the Penn Central took over. 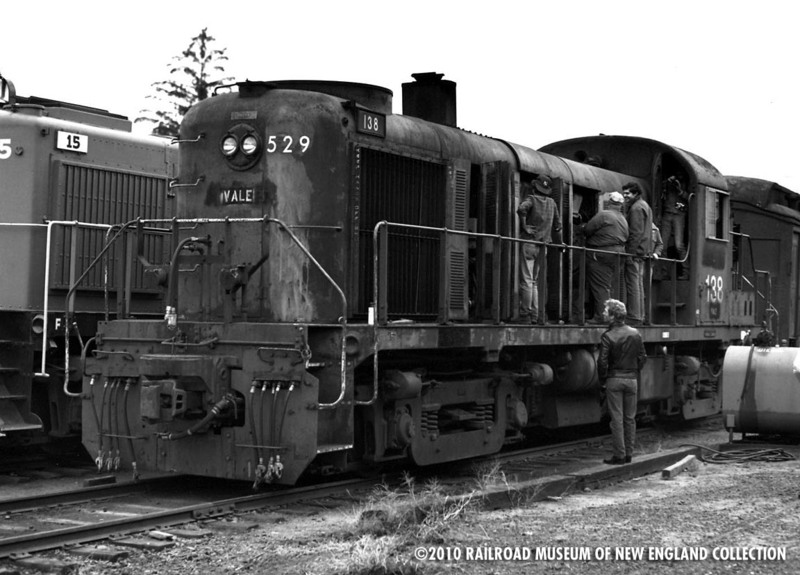 Because they were equipped with NH cab signal systems, the PC generally kept the RS-3s in freight service on former NH trackage, and the 529 became 5536. Spared a DeWitt shop rebuilding in the early 1970s, 5536 kept its original Alco model 244 prime mover. The former NH 529 was sold to Amtrak, reportedly for $1.00 when Amtrak took over the Northeast Corridor on April 1, 1976. The locomotive continued to wear its “funeral black” color scheme applied by the PC but was first renumbered 1338 and 138 shortly thereafter by Amtrak. The 138 continued to operate in New Haven territory on work trains, but occasionally it would rescue a disabled passenger train such as the trouble-prone SPV car runs on the Hartford line. In late July 1985, the final assignments for the locomotive included the Hartford work train, and the shop switcher in New Haven. Replaced by newer engines, the Alco fleet was put up for sale in August 1985 and the RMNE purchased 138 in September of that year. The locomotive was repainted in the 1959 color scheme in October 1986. Extensive cosmetic and mechanical work was done in 1994-95. 529 operated the first RMNE train onto the Naugatuck Railroad in September 1996, and continues to be one of our primary locomotives.